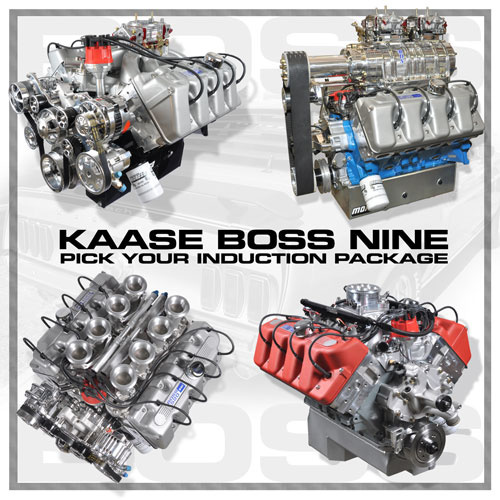 From Street to Strip, Muscle car, Show car, Street rods to full out Racing applications, Jon Kaase Racing Engines INC. are producing Boss Nine replica engines custom tailored for your application. Now you can have the Boss 429 you always wanted in a complete ready to bolt in package! Engines available from 500 to 1000 Horsepower and up to 1500 Horsepower when Blown. The Boss 429 was available as a NASCAR homologation special in 1969-70 Mustangs (and two special Cougars) and the Ford faithful have been lusting for the Blue Crescent/Shotgun engines ever since. While others dreamed, the die-hard Ford junkies at Jon Kaase Racing Engines worked, and brought the Boss 429 back to life on its 40thanniversary. Kaase’s modern Boss Nine combination is based on a high-nodular cast iron cylinder block that can accommodate 429, 460, 521, or 600 cubic inches and output extends from 500 to1,000 streetable horsepower. Kaase allows that displacement beyond 521 cubic inches include a race-oriented cylinder block equipped with 4-bolt main bearing caps. The 10.30-inch deck height block receives a cast crankshaft in the 460ci version (600hp). Engines with 521ci and beyond are founded on a 4340 steel crankshaft joined with 4340 forged connecting rods and Diamond forged pistons. For complicity with pump gas, the compression ratio is usually limited to 11.0:1 or less. Kaase caps the short-block with new aluminum cylinder heads fitted with stainless steel swirl-polish 2.30-inch intake and 1.90-inch exhaust valves activated by WW Engineering 1.75:1 aluminum roller rocker arms. Though the rather large round intake, D-shaped exhaust ports, and marginal cam specs of the original 429 hampered low-speed response, the multiple cam phasing applied to Kaase’s Boss Nine engines has completely eliminated this problem. Customers also have the option of a hydraulic or solid roller camshaft. Bear in mind that the 521ci version produces approximately 770 horsepower and 730 foot-pounds of torque with a hydraulic roller cam. Boss Nine engines are fitted with a single-plane intake manifold for a 4150 or 4500 style carburetor. Imagine a Boss Nine singing beneath the bonnet of your street rod, rat rod, or ’54 Merc. The reaction of the on lookers would be priceless. The New Boss Nine engines can be built with a 4150 or 4500 series carburetor, Stack Injection, Blown or EFI conversion. Pricing starts at $19,900 for a Dyno Tested ready to bolt in Kaase Boss Engine.